Laab is a verb, meaning finely chopped or minced. 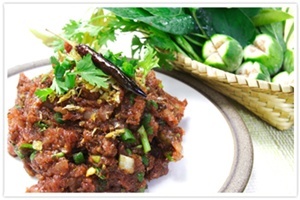 Laab is one of the local foods from the northeast of Thailand (Isaan) and the north of Thailand (including Laos). Laab is also one of the popular foods that people like to have for parties or festivals like weddings, new home ceremony, Songkran or cremation ceremony, etc. The main ingredients of Laab are fresh meat such as pork, beef, lamb or buffalo that need to be chopped thoroughly and mixed with fresh blood and chopped organs. Then it is seasoned with seasoning ingredients like dried roasted chili and various spices, this spice mixture is called “Nam Phrik Laab – Laab Curry”. Laab is usually eaten with all kinds of fresh vegetables especially herbs that have a strong fragrance. 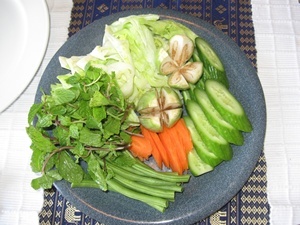 Thai’s call vegetables that you eat with with Laab “Puk (vegetables) – Gub(with) – Laab”. Thai people also like to have Laab with the sticky rice. 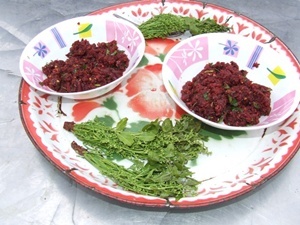 The characteristics of Laab from the north of Thailand are unique and really different from the Laab of Isaan, which has Laab Curry that contains many more spices which are roasted before using them. One big difference is the use of Ma-kaewn as the main spice to seasoning the Laab which makes Laab from the north really unique. Another northern Thai dish that looks a lot like Laab is “Loo”. 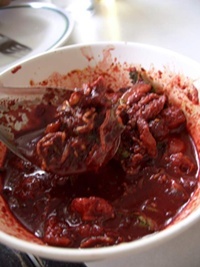 Loo is a dish that uses the fresh blood from pigs, cows or buffaloes mixed with the meat. Loo can also be made using the bile of the animals, but if they use the bile water instead of blood, it is called Loo Pia. 1. Laab Western Lanna styleWestern Lanna Thai includes the provinces from Lamphun to Chiang Mai province. The difference in Western Lanna style Laab is that the Laab Curry will contain different spices. The spices for Pa-Lo dish will be added into the Laab Curry too, and that allows the Laab to have a unique smell and makes it different from other areas of Thailand. Southeastern Lanna Thai includes the provinces from Prae and Nan province. The different in Southeastern Lana style Laab is that the Laab Curry from this area will have more hot spices than other zones. Dee-Bplee and local spices like Ma-kaewn will be added into it. Which will give the Laab Curry a more spicy taste. Northern Lanna Thai includes the provinces from Pa-Yao and Chiang Rai provinces and those to the north. The different is they will use pickled chilli and pickled shallots as the components too. And the Laab Curry will be indicated by which area you live close by, because the Northern Lanna has several different Laab curries. Besides the difference of the ingredients that are put into Laab Curry in each area, there are also differences in how they like the organs to be cooked. So when people are making Laab Moo, some people like the organs to be cooked by scalding them, but others like them to be cooked by frying them. On the other hand, either Laab Neua (beef) or Laab Kwai (buffalo) will only have two ways of cooking, either scald them or use them raw. When making Laab Neua and Laab Kwai, Northern Thai people like to add bitterness into it. So they will use the bile water from the animals to combine with the Laab too. So Laab will become another kind of Laab called “ Laab Kom(bitter) ”. There is one thing that Laab from the north can not be without and that is the side dish vegetables. And they have all kinds of vegetables in each locality, but that doesn’t mean all kinds of vegetables will be able to eat with all kind of Laab either. For example Laab Moo will get along with Fever vine leaves and young olives leaves, but you wouldn’t eat these vegetables with Laab Gai. The vegetables that are considered basic side dish vegetables include Vietnamese Coriander, mints, Houttuynia, Polyscias, green onion, coriander, long coriander, lettuce (green and white), Asian Rat-tailed radish and dill. Some places like to have Laab Moo with fresh tomatoes, but the most strange is that some like to have their Laab with Thai Eggplant in fish sauce, or with young jackfruit leaves or have with Dee-Bplee. Well, I think it is strange, but everything is all good from plants to herbs. 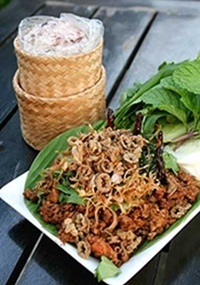 Laab from the Northeast (Isaan) of ThailandLaab Isaan is the most popular dish among Isaan people. This dish is considered a spicy salad. The way it is made is to start by chopping or cutting the meat into small pieces, similar to ground meat. Then it is seasoned to taste with fish sauce, lime juice, sugar and sprinkled with ground roasted rice, chili powder, chopped mint leaves, chopped green onion and chopped coriander. This type of Laab can also be served two ways; either raw or cooked. If raw they called “Goi”. Sometimes they will add the organs or fresh blood into the Laab too, and if so they called this “Laab Leut (blood)”. The side dish vegetables will be local vegetables that can found in the area like cucumber, young White Popinac leaves, Oroxylum indicum, young olives leaves, young Carambola leaves, young Bael leaves, young Neem Tree leaves, etc. Beliefs and popularities about Laab 1. Laab is considered the type of food that seems to go well with liquor, like a pair. People are always drinking with their Laab, so Laab is typically the food eaten with alcoholic drinks. In addition to that they also believe that eating Laab with liquor will help with special and tonic properties. 2. Laab is considered a food for a man. If you’re a virile man you should be able to eat Laab, if not you may be seen as a weak person, and not brave. Or if you’re woman and eat Laab, you may be seen as brave as a man, not as a lady. In recent times, the negative attitude about women who eat Laab has decreased. So we find that women are eating Laab in public more. Before that, when women liked to eat Laab, they would have eaten it in their households only. Added to that is the fact that the role of women in Thai society has increased; these days women like to associate together by eating Laab and drinking like men. And for the pregnant woman, who really likes to eat Laab while pregnant, they believe that the child she is carrying will be a boy. 3. When making Laab in the past, people would usually like to make it with big and important animals like cows or buffaloes. Normally, the ancient Thai people would eat rice with fish, chili sauce and vegetables as a daily meal and they have no opportunity to eat cow, buffalo or pork very often. So for this reason, eating Laab each time is considered a “special meal” for them. Laab is also considered a high level food, a special delicious food and expensive food. And people are usually making Laab for the guests, to thank them for their help and to represent the party with the most willingness and thankfulness. Some people say that to be fed with Laab is considered to be an honor. And this idea may have originated from providing or eating Laab together. In addition, people who can eat Laab or feed Laab to others more often are seen as a rich person or someone who has had good luck like winning the lottery, etc. In Thai culture, those people who have the opportunity to have an important party, especially weddings or new home ceremony without making Laab for the guests will be viewed as a miser. So, Laab is considered the main course for any party and that makes Laab look like a symbol of the party whenever it is served. When hearing the sound of chopping meat, smelling of burnt chili and spices, combined with the sneezing or choking sounds from the smell of burning pepper and hailing sounds from the cooks as they play with each other it shows that the house is having a party or special occasion going on. But if a party doesn’t have that atmosphere, that party may not be seen as playful as it should be.